We have another lovely day at the Sebastian Inlet. Winds are blowing out of the East-Southeast at 11 mph, gusting to 14 and there is a light chop on the water. Winds have picked up from earlier in the week but it looks as if seas will cooperate with our boaters this weekend. Wave intervals are predicted to be 7 – 8 seconds apart, it could get a little bumpy. Always check the NOAA forecast prior to boating. The bite seems to be picking as conditions become calmer. Blue fish remain the dominant species going in and out of the inlet but they can be landed from the beaches as well, some big fish in the 10 lb. range have been landed. Sheepshead and Spanish Mackerel have been increasing in numbers. Sheepshead love structure, you can find them hanging around docks and pilings. Use any crustacean to lure them in, especially sand fleas. Small crabs, shrimp and clams are good baits or you could try jigs tipped with the same. Black Drum, Snook and oversized Reds like the one we feature today are coming over the rails in small numbers too. Sportswriter Ed Killer of Florida Today reports the Trout bite is picking up in the Indian River Lagoon. Get out this weekend and enjoy the great weather! Our angler of the day is 15-year-old Finn Elberts who is visiting from Deerfield, IL. 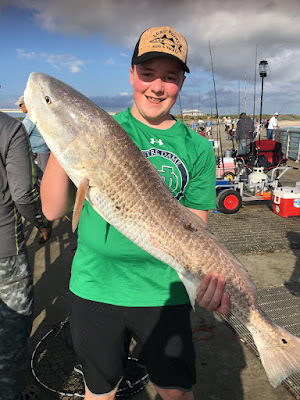 Finn and his family fished the north jetty and landed Blues, Jacks and Sheepshead before Finn experienced the thrill of a lifetime by landing this real nice oversized Red. Finn was using live shrimp and with the encouragement and net help from the local inlet fishermen, Finn brought it over the rails for a couple of quick photos and a safe release.